*Ahhhh, Friday. My day off. The day that starts out a little slower, and I can usually ease into the day. *I spent a little time making deviled eggs for book group today. On my last visit to Boise, Zoe and I visited my cousin Judy, and she gave me a box of candlewick dishes she had at her house. 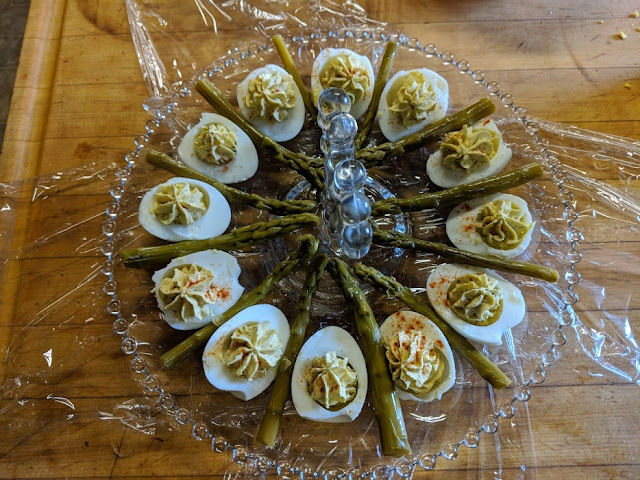 One of the pieces was a beautiful egg dish to serve deviled eggs on. I thought this would be the perfect dish to take to book group today to display the eggs. And I thought I would get a little fancy and add some pickled asparagus to the plate as well!! Thanks again, Judy, for passing on the beautiful dishes. Our Grandma West was the original owner of most of the Candlewick dishes I now have at my house. *Since the beginning of the year, Paul and I have made a commitment to have a “date night” each month. We thought tonight would work the best with our May schedule. When Paul arrived at home, we drove to Coeur d’Alene, and started off with a trip to Fred Meyer. It was a very providential trip, because they were having their annual Founder’s Day Sale, which includes their great deal on a flat of annuals for only $10.99. So we bought flats of petunias, lobelia, marigolds and impatiens. Now I hope to get my containers planted this coming weekend!! *Then it was a trip to Costco to pick up a few items. I thought it would be crazy there, because it was Friday, but it wasn’t. There was lots of parking, and the lines were not long at all. *Paul suggested we go and eat at Moontime. We had not eaten here for quite a while, so we enjoyed out meal. Paul had a lamb burger (without the bun, of course), and I enjoyed a half a Caesar Salad. We also ordered some curry cashews as an appetizer, and they were very delicious. *When we arrived home, Paul went outside and mowed the lawn for about 20 minutes, then we started watching the movie The Help. I had seen it a few years ago, but Paul had not seen it. One of our friends, Lori Hendrix, brought the DVD to school and suggested Paul watch it. We got about half way through before it was time for bed!! We were excited when we heard from all the girls last night, and it was so good to hear their voices! !